Do you see what I see? Can you see what I see? Are you blind, or are you only pretending to be blind? Do you feel what I feel, or are you just pretending to be heartless? Aren’t you embarrassed to kill people? Maybe you don’t have a conscience. Dear brothers, aren’t you tired of destroying our country? The same bombings, the same streets, the same war, the same fears repeating daily? Don’t you see that the same students go to school every day, the same people go to work? Can’t you see? You will not stop us. Oh, I forgot, you are pretending to be blind. Taliban? That’s your name, right? Come face me. Face my writings, my words, my pen, my paper. I am Aysha. I am certain that I am more powerful than you are. Oh, I forgot, you are heartless, gutless. You don’t have the strength to face me. You are nothing more than fear in people’s minds. Don’t you know fear is powerful only in the dark? Don’t you know that the sun shines after every dark night? We are not scared of you. I am not scared of you. You will not stop me from living my life. Oh, I forgot, you don’t have a mind. If you did you would not be called Taliban, and you would not kill others. I understand now, yes, I understand: Taliban has no heart, no mind, no eyes! You are not humans. Humans have hearts and minds and eyes. That’s why we feel, why we think, why our eyes express the life inside. Taliban must be some other creatures, junk creatures. I understand now, yes, I understand. 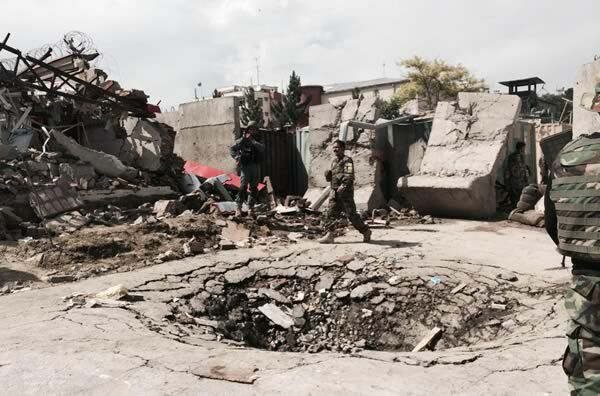 Photo of crater caused by Taliban suicide car bombing outside the Afghan parliament building in Kabul on June 22, 2015 by Nathan Hodge. This is one of the most powerful, amazing pieces I have ever read. Your strong, blunt words are an explosion of good in the world. This is an amazing piece. You tell the truth of Taliban terror. You are a brave, wise woman. Well done! I love how straight forward you are in this poem. It really brings forth a powerful message of the violence that really happening in the world. The strength and value put into this poem really sends home the message of trying to change the way people solve problems. Harming countries, people and the environment is not a positive impact on the citizens. Very well written, I truly enjoyed it!